On Monday 4th December, eight innocent civilian people were incarcerated during a raid of the savage foreign invaders escorted by their internal mercenary forces in ‘Barag’ village of ‘Mohammad Agha’ district in Logar province. On Wednesday 6th December, twenty three civilian countrymen were martyred and two more were injured in the indiscriminate bombing of the savage foreign occupying forces in ‘Doaab’ and ‘Ghogeza’ areas of ‘Hisarak’ district in Nangarhar province. On Wednesday 6th December, local civilian people were severely beaten; three innocent villagers including a Mullah Imam (the one who leads congregational prayers) were ruthlessly martyred while twelve more people were taken away as prisoners during a brutal raid of the savage foreign invaders in collaboration with their internal mercenaries in ‘Khairtoot’ area of ‘Shah-Wali Kot’ district in Kandahar province. On Wednesday 6th December, Dr. Abdul Wakeel’s Lycee (an educational institute of the higher secondary level) was severely damaged while some of its essential equipment was taken away during a raid of the savage foreign invaders along with their internal mercenary forces in ‘Narkh’ district of Maidan-Wardak province. According to ‘Izzatullah’ and ‘Mohammad Haleem’, the head and teaching director of this lycee respectively, most of their important documents, a projector, five computers and all laboratory equipment were taken away by the joint invading forces. On Wednesday 6th December, civilian houses were thoroughly searched out, four innocent people were martyred while four others were taken away as prisoners during a raid of the savage American invading forces escorted by their internal mercenaries in ‘Tangi’ valley of ‘Said Abad’ district in Maidan-Wardak province. On Friday 8th December, a health clinic was plundered by the local stooge forces in ‘Tagni’ valley of ‘Said Abad’ district in Maidan-Wardak province by looting all its medicines, beds, a power generator and other essential equipment. This clinic was sponsored by ICRC, and was the only health caring center for the local people which was totally paralyzed by the local mercenary forces of puppet regime. On Friday 8th December, several houses of civilian people were demolished in which seven innocent people were martyred during a blind bombardment of the savage foreign invaders in ‘Qarghan Tapa’ area of ‘Imam Sahib’ district in Kunduz province. On Saturday 9th December, two innocent countrymen were ruthlessly martyred in a blind drone strike of the savage foreign invaders in ‘Daga Nasir Khail’ area of ‘Bati Kot’ district in Nangarhar province. On Sunday 10th December, ‘Noor’ and ‘Kaudi’ areas in ‘Said Abad’ district of Maidan-Wardak province were raided by the savage foreign invaders in collaboration with internal mercenaries, in which main gates of several civilian houses were broken in blasts; houses were searched out; local people were severely beaten, and a clinic in ‘Noori’ village was plundered by looting all its medical equipment. Similarly, seven innocent villages including a Mullah Imam of the village were incarcerated and taken away as prisoners. On Sunday 10th December, a civilian transport vehicle was indiscriminately targeted in a blind drone strike of the savage foreign invaders in suburbs of ‘Zurmat’ district in Paktia province, in which four civilian people including a child was ruthlessly martyred on the spot. On Monday 11th December, a religious madrassa was raided by the savage American occupying forces in co-ordination with their internal mercenaries in ‘Durzi’ area of ‘Mandozi’ district in Khost province. In this brutal raid, besides looting all necessary things of everyday use, twenty six students were taken away as prisoners. On Monday 11th December, four civilian people of one and the same family were ruthlessly martyred during a raid of the savage foreign occupying forces escorted by their internal mercenaries in ‘Salih-Zi’ area of ‘Chaprihar’ district in Nangarhar province. On Friday 15th December, a religious educational institute was raided by the savage foreign occupying forces along with their internal mercenaries in ‘Tatanak’ area of ‘Khogyani’ district in Nangarhar province, in which four students of this institute were relentlessly martyred while two other civilian people were incarcerated. On Saturday 16th December, a religious madrassa was raided by the internal mercenary commando forces backed by the savage foreign invaders in ‘Mian Rodi’ area of ‘Sangin’ district in Helmand province, in which the premises of madrassa were destroyed while three students were taken away as prisoners. On Monday 18th December, three children were martyred while two civilian people were injured in the indiscriminate mortar shelling of the local amateurish forces in ‘Nahr-i-Siraj’ area of ‘Grishk’ district in Helmand province. On Monday 18th December, a religious scholar (named Moulavi Mangal) was ruthlessly martyred by the local stooge forces in ‘Shado’ village near ‘Qalat’ city, the capital of Zabul province. On Tuesday 19th December, nine innocent civilian people was detained and taken away as prisoners during a raid of the savage foreign invaders escorted by their internal mercenaries in ‘Joi Shor’ area of ‘Charbolak’ and ‘Khadar Khail’ areas of ‘Chamtaal’ district in Balkh province. On Friday 22nd December, three civilian countrymen were martyred while two more were injured in the random mortar shelling of the internal stooge forces in ‘Shiwan’ area of ‘Bala Buluk’ district in Farah province. On Saturday 23rd December, two innocent countrymen were martyred while three others were detained and taken away as prisoners during a brutal raid of the savage foreign occupying forces in ‘Musazi’ area near ‘Tareen Kot’ city, the center of Uruzgan province. 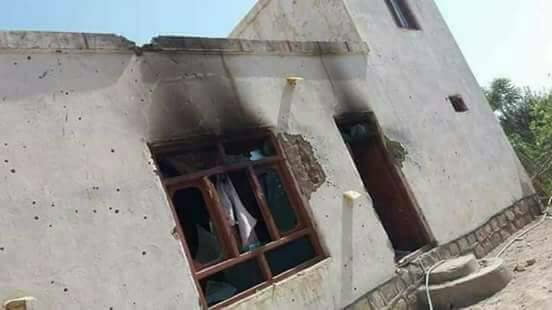 On Monday 25th December, civilian houses were raided by the savage foreign invaders in collaboration with their internal mercenary forces in ‘Mirza Khail’ area of ‘Khogyani’ district in Nangarhar province. In this brutal raid, significant amount of valuables were looted from the houses; two innocent villagers were martyred; one person was badly injured, while two others were detained and taken away as prisoners. On Tuesday 26th December, a local mosque and a shrine were demolished by Daish (i.e. ISIL) armed militiamen in ‘Gardi Ghoas’ area of ‘Momand Dara’ district in Nangarhar province. A day earlier, a religious scholar named ‘Moulavi Said Hazrat Haqqani’ was ruthlessly martyred by the unrestrained armed men of Daish in ‘Khogyani’ district of Nangarhar province. Similarly, sometimes ago, eight civilian people including a Mullah Imam, all of them offering prayers in a central mosque, were martyred in a blast by Daish militiamen in ‘Momand Dara’ district of this province. On Friday 29th December, twelve Mullah Imams (a religious scholar who leads congregational prayers) were abducted and then four of them were relentlessly martyred by the unrestrained armed militiamen of Daish in ‘Darzab’ and ‘Qushtapa’ districts of Jozejan province.